The New York City Council passed legislation on Tuesday mandating that the government agency that oversees the city’s $85.2 billion annual budget provide all budget documents to the public in an easily accessible and machine-readable format. The legislation, sponsored by Council Member Ben Kallos, chair of the governmental operations committee, requires the Office of Management and Budget to post documents released in the annual budget process to the city’s open data portal within 10 days of posting them on their website. OMB produces multiple iterations of the city’s budget each year as the annual expenditure plan is negotiated between Mayor Bill de Blasio and the City Council. These include the preliminary budget proposal, the executive budget proposal and the final adopted budget, each of which contain hundreds of pages with detailed breakdowns of agency spending and city revenues. The agency also issues a budget modification document in November. 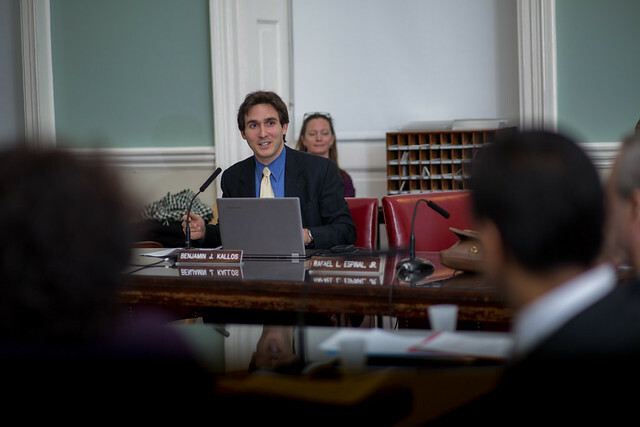 An ardent advocate of government reform and a software developer himself, Kallos has consistently pushed the de Blasio’s administration to increase the amount of data available on the open data portal. The administration, for its part, has made significant progress since the city’s open data initiative was first launched in 2012 by former Mayor Michael Bloomberg. It’s unclear whether the mayor will sign the bill into law, although he has yet to veto a single bill passed by the City Council. “We look forward to reviewing the legislation,” said Freddi Goldstein, a mayoral spokesperson on budget matters, in an email. The bill would go into effect immediately if the mayor signs it, but it would only cover future budget documents and would not apply retroactively. Under de Blasio, the city’s budget has increased by 17.2 percent, from $72.7 billion in the last modification under Bloomberg to $85.2 billion for fiscal year 2018. Kallos held out hope that past budgets would eventually be included on the open data website. “I would love to be able to compare our city’s budget going back as far as we have records for,” Kallos said. On Wednesday at City Hall, Council members led by finance Chair Julissa Ferreras-Copeland had questions for city budget officials, who explained that most of the new spending stems from an increase in federal and state funding. The current fiscal year runs through June. The budget modification does not account for how Trump’s proposals -- from a promised freeze on funding to so-called sanctuary cities to tax code changes to eliminating the Affordable Care Act -- may affect the roughly $7 billion in federal money that comes to the city annually of late. While Trump may have a difficult time following through on his promise to withhold all funding from sanctuary cities -- which are those like New York that are welcoming to undocumented immigrants -- he may be able to take a piecemeal approach. Mayor Bill de Blasio has vowed to fight several of Trump’s most extreme campaign promises, like mass deportations. At the budget hearing this week, City Council Members and Dean Fuleihan, director of the Mayor’s Office of Management and Budget, agreed that in the coming months, the Council and the administration must work together to evaluate the impact of possible federal actions and prepare a response. “Our fiscal management will be a critical asset as we move into a period of uncertainty at the federal level,” Fuleihan said. “At this time, the consequences of federal action are unknown and potentially widespread.” He noted several times throughout the hearing that city reserves are at “historic levels.” This is true in terms of the raw dollar amount, which is several billion, but with a $83.4 billion budget that has expanded rapidly under de Blasio, the city is somewhat short of a safe “budget cushion,” according to Comptroller Scott Stringer and other watchdogs. The November budget update anticipates the $1.3 billion increase in spending from the June adopted budget, much of which stems from increases in federal and state funding, including aid for Hurricane Sandy recovery projects. The plan forecasts a $127 million reduction in projected tax revenues, and also includes $1 billion in savings, through changes in municipal government function, like increased use of electronic payments and expanded car sharing among agencies, as well as spending re-estimates at various agencies. Gotham Gazette previously reported that OMB had launched a new citywide savings unit to coordinate greater agency savings. Other concerns with the November Plan addressed at the hearing included the added $115.1 million in new needs funding allocated to the Department of Homeless Services for increased shelter costs; the inclusion of $130 million to cover pension fund obligations due to the fund’s underperformance this year; and $14.4 million allocated to the Department of Correction related to the implementation of the 14-point plan to reduce violence in Rikers Island. “It's important to remember that shelter costs have been increasing since the end...of 2009, when there were about 37,000 in shelters,” Fuleihan said (there are currently more than 60,000 in city shelters). “We have, with your help, instituted programs - government assistance and other preventative measures - that we believe have changed what the shelter population would be today,” Fuleihan added. Mayor de Blasio has also recently said the city will be coming forward with new plans to tackle the homelessness crisis. Council Member Helen Rosenthal took issue with the city’s rising pension obligations due to the underperformance of the city’s pension funds, noting that the November Plan included nearly $100 million more than what was spent to cover the city’s pension obligations in FY 2016, and that OMB projects the number will increase by about $300 million in the following years. Pensions to former city workers are guaranteed, with city funds required to make up gaps in the returns from pension fund investments. The city is currently paying billions of dollars per year toward pension obligations. The Department of Correction also accounted for a significant amount of the funding for new needs added to the November Plan. As Ferreras-Copeland noted, the de Blasio administration has consistently increased funding “over multiple financial plans for the DOC’s contract with McKinsey Group to accelerate and sustain the department’s anti-violence reform agenda.” Since fiscal year 2016 (July 1, 2015-June 30, 2016), the administration has added $24.2 million for consulting fees, including the $9.9 million for consulting fees included in the November Plan. Yet, Ferreras-Copeland said, neither the administration nor DOC has shared details of the contract with the Council, or information regarding the exact nature of the McKinsey Group’s role in DOC’s reform agenda. “Can you provide more details on why administration increased funding for DOC consulting fees at each fiscal year, and when do you expect McKinsey Group to finish its consulting for the department on its reform agenda?” Ferreras-Copeland asked, adding that she is seeking information clarifying what exactly the Council should be expecting to see as a result of the added funding. Fuleihan said the McKinsey group is expected to finish its consulting in April, which the additional $9.9 million from the November Plan should cover, and promised to get Ferreras-Copeland information regarding the McKinsey Group’s role. While the population at Rikers Island jails is down significantly under de Blasio, to about 7,500 daily, violence continues to plague the facilities. There are about 10,000 detainees and inmates across all city jails on any given day at this point. Overall, the November Plan’s inclusion of a savings program and increases to city spending were well-received. Some specifics regarding the budget update remain troubling, like the increasing pension obligations, which are projected to cost the city more in years to come, and homeless shelter costs, yet much of the conversation at the hearing was dominated by concerns over New York City’s uncertain financial future when Donald Trump becomes President. Funds from the federal government reflect about 10 percent of the resources in the city operating budget this year. Trump’s comments have raised concerns among city officials. 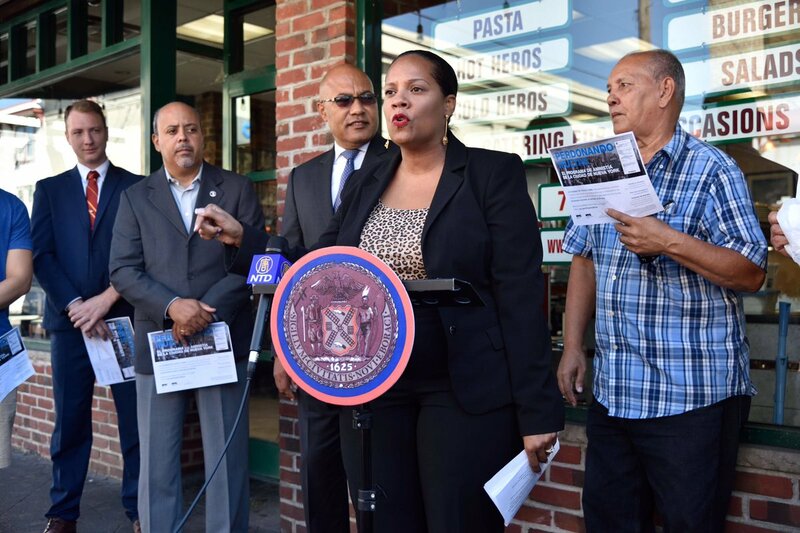 “Federal funds make up a significant portion of several agencies and authorities - DOE, HPD, NYPD, and NYCHA,” Ferreras-Copeland said, later adding Health + Hospitals, and asking Fuleihan what could be done to mitigate potential damage to city resources moving forward. “Right now, it’s very difficult to make an assessment as to what is going to happen,” Fuleihan said, though that picture should become clearer in the coming months. “We should, working together, coordinate our response to any action that may be taken in Washington,” he told the Council, and identify what federal aid may be at risk. There were 313,092 full-time and full-time equivalent positions employed by the City of New York as of June 30, the final day of last fiscal year, according to headcount data provided by the Mayor’s Office of Management and Budget (OMB). According to forecasted staffing levels in the Adopted Budget for Fiscal Year 2017, released by OMB on June 14, the City plans to add another 10,108 full-time and full-time equivalent (FTE) positions by the end of the current fiscal year, to bring the total number of city government employees to 323,200 by July 1, 2017. According to the FY2017 Adopted Budget, there are 12 city agencies each forecasted and budgeted to add over 300 full-time and FTE positions by next summer. Those agencies are, in order of budgeted additional hires: the NYPD (civilian staff only); the Department of Social Services; the Administration for Children’s Services; the Department of Corrections; the Department of Health and Mental Hygiene; City University of New York; the Department of Environmental Protection; the Department of Information Technology and Telecommunications; The Department of Education (pedagogical staff only); the Department of Sanitation; the Department of Citywide Administrative Services; and the Department of Buildings. This increase comes on the heels of unprecedented growth in city government headcount through the first two-and-a-half years of Mayor Bill de Blasio’s term. 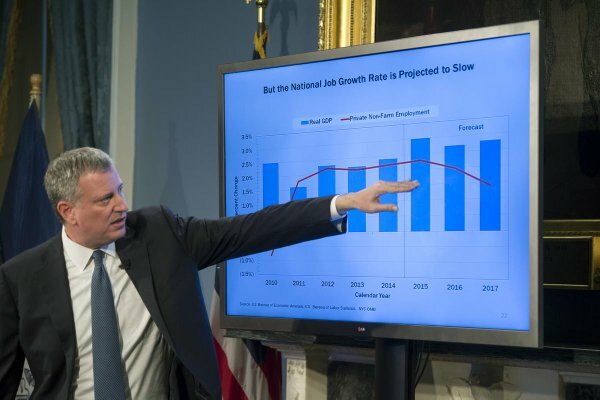 De Blasio has enjoyed robust city revenues and private sector job growth, allowing him to increase city spending, including on hiring of government personnel. While the city has also been able to increase savings to record levels, de Blasio has received some criticism for the increases in city spending and headcount. Still, he is forging ahead with additions at a variety of city agencies. What is not always clear to the public, though, is what positions are being added and why; what happens when agencies are not able to fill the positions they are budgeted for; and why increases in certain types of personnel are not accompanied by decreases in others. Under de Blasio, the two most high-profile broad personnel increases have been the addition of hundreds of new pre-kindergarten teachers and the addition of about 1,300 new police officers, staffing the expansion of de Blasio’s universal pre-K program and his neighborhood policing model, respectively. “This administration has proven that you can be both responsible and progressive,” said Freddie Goldstein, a mayoral spokesperson for budget matters. “Our increased headcount helps us move forward the initiatives that make a real difference in the lives of New Yorkers - Pre-K For All, Vision Zero, more police officers keeping people safe. We’ve budgeted for these new hires and have done so while increasing our reserves to historic levels,” said Goldstein. The adopted budget, released after a new budget agreement between the Mayor’s Office and the City Council, is the last step in the process starting with the Mayor’s Preliminary Budget and including the Mayor’s Executive Budget, two rounds of City Council hearings, public lobbying, and behind-the-scenes negotiations. In part, the adopted budget indicates how OMB will allocate funding to different city departments, much of which is dedicated to agency personnel, including new employees each agency is expected to hire. Providing a clear snapshot of the positions currently in the process of being filled requires information from city agency representatives, departmental website job portals, and other databases. 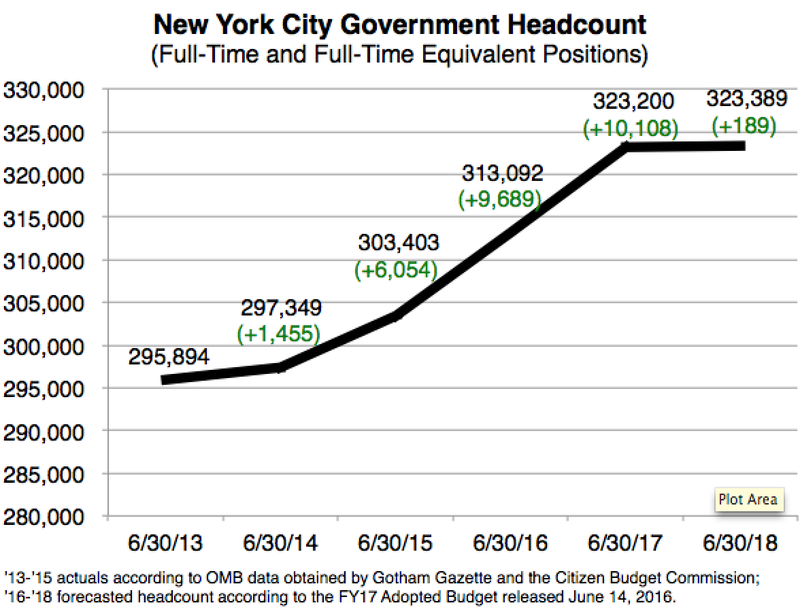 While forecasted headcount is relatively easy to find on the OMB website, Gotham Gazette needed to request the end-of-fiscal-year actual headcount data from FY13 through FY16 and more information regarding the types of positions being filled. The actual headcount data from 2013 was provided by the Citizen Budget Commission (CBC), a nonpartisan nonprofit budget watchdog group. While the city is now several months into the new fiscal year, executive budget hearing reports from the Spring, while dated, also offer important insight into each department’s intentions when it comes to hiring. Agencies do not necessarily hire people for as many positions as the city has allocated funding, nor is there a maximum headcount departments may not surpass, though agencies must get permission from OMB for additional spending and often must explain why they do not hire for all the positions they have been budgeted for if that is the case. The Department of Social Services (DoSS) was forecasted to add 805 positions in FY16. Instead, DoSS actually decreased its headcount by 289 full-time and full-time equivalent positions over the course of the fiscal period. And like with other agencies that did not meet last year’s forecast, DoSS is again forecasted to add many new hires in FY17, in its case for 1,616 positions. Two questions that often faces agencies, OMB, and the Mayor’s Office is why an agency may not be able to reach its targeted hiring and whether money should be reallocated in the following budget for unfilled positions. The answers to these questions are determined in budgetary meetings between OMB teams and representatives from individual agencies throughout the year as headcounts real and forecasted are in flux. There can be a variety of reasons why an agency does not meet its forecasted headcount, including difficulty competing with private sector employers for highly skilled applicants or finding it can do its work with fewer employees than initially expected. There are also logistical hurdles in hiring and not every agency has a well-oiled hiring process. Filling a large number of positions can be time-consuming for those most involved in hiring. It can also take time for higher-ups to approve certain hires. While it’s more common to hire fewer employees than budgeted, in some circumstances agencies have expanded their headcount past the yearly budgeted amounts. When agencies exceed their forecasted headcount the circumstances often have to do with new city policies, as presented by the Mayor or the Mayor and the City Council, that involve hiring new employees. There are several city departments involved in different phases of the hiring process beyond each agency’s internal process. While OMB has authority over allocation of the budgeted headcount, the Department of Citywide Administrative Services (DCAS) has actual oversight of hiring processes, and internal human resources offices handle the execution of each agency’s hiring protocols. DCAS is responsible for administering the civil service system, which largely pertains to uniformed city employees like police officers, firefighters, corrections officers, and paramedics, and includes plumbers, electricians, and many other positions. Someone hoping to be hired in one of these positions must pass a civil service exam to be placed, in order of exam score, on the Civil Service List. The human resources department at each agency then hires from that list for the positions it covers, which often excludes top positions at each agency. There are several exceptions to this system. For instance, the Mayor’s Office has its own independent hiring process for the hundreds of positions that fall under its purview. This is another area where de Blasio has greatly increased headcount. Commissioner appointments are overseen by the Mayor’s Office of Appointments and made by the Mayor, oftentimes in consultation with the relevant Deputy Mayor. Other top departmental positions -- like Chief of Staff, Deputy Commissioner, Director of Intergovernmental Affairs, etc. -- require agencies to receive various levels of approval depending on the situation. The Office of Appointments also works with the Department of Investigation, City Council, and the NYPD to vet potential higher-level managerial candidates. While the NYPD is continuing to add police officers to fill the additional 1,297 uniformed positions that the Mayor previously agreed to in negotiations with the City Council, according to the Adopted Budget for Fiscal Year 2017, the NYPD is forecasting to add an additional 1,930 civilian staff by next summer. These civilian openings include school safety agents, police communications technicians (911 operators), and traffic enforcement agents, all of which are posted on the NYPD website. The NYPD press office said there are currently 1,627 open positions and that the department expects to fill all of them. The NYPD currently employs 35,990 uniformed officers, according to the department, while it seeks an average uniformed headcount of approximately 36,300 officers. According to OMB data, the NYPD’s uniformed headcount grew by 1,372 police officers in the previous fiscal year to reach its current number. The police academy is training four classes of officers throughout the fiscal year, according to the department, though the adopted budget only funds 35,780 of those positions -- 210 fewer officers than the department already employs. According to the NYPD’s Executive Budget Hearing Report, the additional school safety agents will be sent as “meal relief” to schools with only one safety agent; the 911 operators will be staffing the newly opened Public Safety Answering Center II in the Bronx; and the traffic enforcement agents will be primarily dispatched in Manhattan to enforce the “Block the Box” initiative, aimed at enforcing the prohibition on vehicle operators obstructing traffic at an intersection. The Department of Education (DOE), which has traditionally had the largest headcount in the city and has sustained the most significant growth in headcount of any city agency under de Blasio, is continuing to add to pedagogical staff while also being budgeted to lose civilian headcount. The DOE is forecasted to add a total of 9,276 full-time and FTE positions (pedagogical and other) by the end of de Blasio’s term -- more than any other city agency. The department has already added 7,343 of those positions in the first two-and-a-half years under de Blasio. As of October 4, there were 120 open non-pedagogical positions listed on the DOE website. Pedagogical positions are not publicly listed on the department website. In order to view pedagogical listings, qualified applicants must file a general application to work in the DOE school system before being granted access to the teachers jobs portal. A large portion of the DOE’s initial headcount growth under de Blasio is attributable to the mayor’s universal pre-kindergarten initiative, for which the department is continuing to fill positions, even those beyond classroom posts, like the Director of Special Projects that will “oversee the implementation of the Pre-K component of ThriveNYC, a citywide, mayoral initiative to support the mental health of New Yorkers,” according to the job description posted online. According to the DOE’s Executive Budget Hearing Report from May 16, 2016, a good portion of the budgeted headcount growth for the current fiscal year is in response to rising need around special education students and properly serving those students in district schools. In addition to hiring teachers trained in special education, the DOE is filling positions like “Special Education Operations Manager, Charter Partnerships” and “Director of Data Management - Special Education” -- both highly technical roles that will aid the department in providing the necessary tools and expertise needed for students with individualized education plans. Skilled data analysts are in high demand both in and out of government - this is one type of position where it can be more difficult for government agencies to attract qualified applicants. The DOE declined to respond to a request from Gotham Gazette seeking information explaining the agency’s protocols and infrastructure for filling open positions and actual headcount data. Currently, the Department of Sanitation has approximately 200 civilian vacancies, according to Vito Turso, a spokesperson for the department. According to the FY17 adopted budget, Sanitation is set to add a total 393 civilian and uniformed positions by next summer. As of October 4, there are 32 Sanitation civilian openings accepting applications via the citywide jobs portal. Civilian positions are first approved by OMB and then approved by the department’s internal human resources office. Within the department, the areas with the largest number of civilian vacancies are in the program areas of technology, building maintenance, motor equipment, and enforcement, according to Turso. Uniformed sanitation worker positions are filled through the civil service list. While the FY17 adopted budget forecasts only 25 additional uniformed positions, Turso said the department is in fact expecting to hire over 350 sanitation workers by June 2017. The Department of Buildings (DOB) is expanding its headcount as well. According to department spokesperson Joseph Soldevere, DOB’s hiring target for FY17 is 257 positions, including 57 for inspections, 79 technical positions, and 121 administrative or other staffers. The city has allocated funds for an additional 181 positions, according to the FY17 adopted budget, but the department has set their own goal of hiring 257 employees, as stated by Soldevere. “The [DOB’s] staffing is up 31% over the last four years, and up 18% over the prior year,” said Soldevere, crediting “an expanded advertising push for job opportunities, numerous interview days for new graduates and industry professionals, and increasing our recruitment targets,” for the headcount growth. This increase comes as New York City is experiencing a historic construction boom, which as Soldevere pointed out, makes it difficult to hire construction professionals for public service positions. DOB is largely responsible for permitting construction and for building inspections. 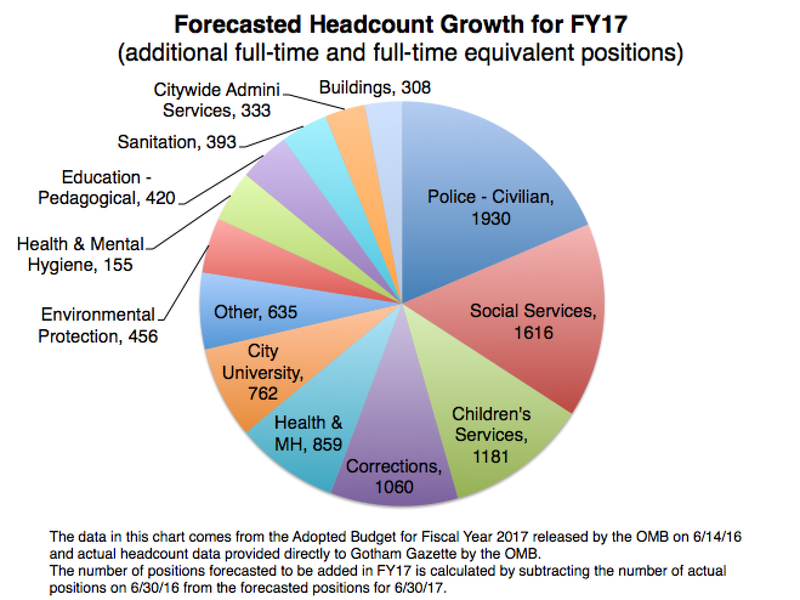 The Department of Corrections (DOC) is also expanding its civilian and uniformed headcount in the current fiscal year. According to actual headcount data provided by OMB, DOC had 11,508 employees at the end of June. Based on the FY17 adopted budget, DOC expects to add another 1,060 positions by the end of FY17. According to DOC’s Executive Budget Hearing Report, several new uniformed and civilian staff will be allocated to the central visiting center on Rikers Island -- where there was a rise in inmate-on-inmate violence over the last year -- in order to better keep drugs and weapons out of inmate possession. At many smaller agencies and offices, headcount has drastically increased in proportion to the number of department employees before de Blasio took office. One such agency is the NYC Commission on Human Rights (CCHR), which is forecasted to double in size by the time de Blasio’s current term is over -- increasing from 61 positions in 2013, to 123 by the end of FY17. Internally, the department has two human resources staffers and they use the citywide jobs portal to fill openings, according to CCHR spokesperson Seth Hoy. “The rapid expansion of the NYC Commission on Human Rights over the last two years is reflective of Mayor de Blasio’s mission to ensure a viable and effective venue for all New Yorkers to report discrimination and get justice, regardless of who they are, where they came from or who they love,” said Hoy. 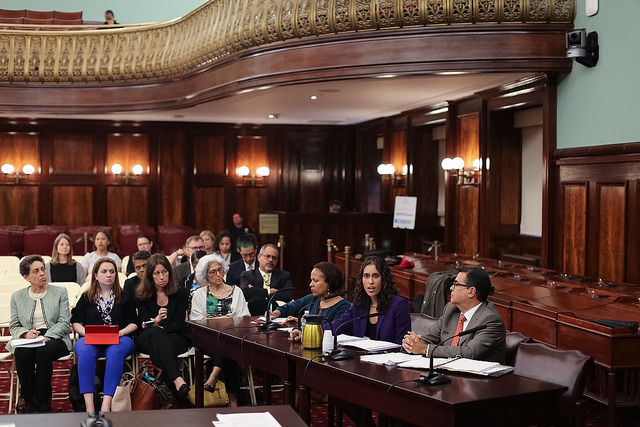 Following Mayor Bill de Blasio’s April 27 release of his $82.2 billion Executive Budget for fiscal year 2017, the City Council on Friday held the first of many hearings to look at the latest iteration of the city’s spending plan for the year beginning July 1. As the Council examines the executive budget through a series of agency-focused hearings, negotiations around key priorities and final adjustments will be taking place behind the scenes. The executive budget increased overall spending by only about $100 million compared to the preliminary budget, but added a number of new initiatives paid for by $1.25 billion in additional savings, including an ambitious plan to overhaul the floundering municipal hospital system, New York City Health + Hospitals. Leading Friday’s initial hearing, City Council Member Julissa Ferreras-Copeland, chair of the finance committee, commended the mayor for funding a number of proposals outlined in the Council’s response to the preliminary budget. These included additional funding for 50 ambulance tours, increased staffing at the parks department, boosting the pay rate for contractual employees at the Department for the Aging, and additional education funding, among others. Ferreras-Copeland stressed that despite nearly $2 billion in new spending since the 2016 adopted budget, a 6.2 percent increase, many of the Council’s top priorities had not been funded, including youth jobs programs, expanded after-school programs for elementary school children, restoring 34,000 slots to the summer programs for city youth, baselining case management services for seniors, and providing additional funding for cultural institutions. In its preliminary budget response released April 4, the Council had identified about $790 million in proposals of which the executive budget only funded $61.9 million worth. 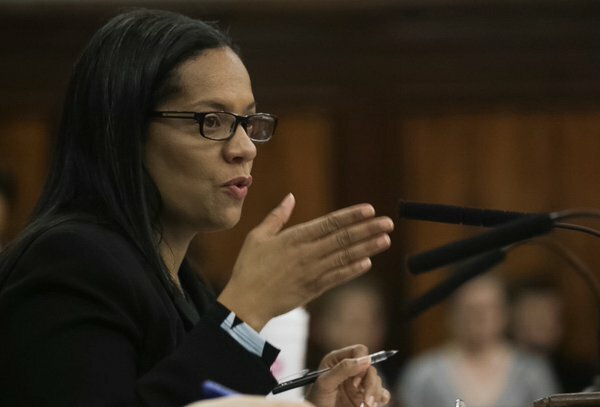 Ferreras-Copeland also highlighted continuing concerns over a lack of clarity in the Citywide Savings Program, pointing out that most savings were from spending re-estimates and delays in spending rather than programmatic savings in agencies. She recommended that savings be categorized under these fields and explained in detail to provide more transparency. The mayor said during his executive budget presentation that he expects additional agency savings to be identified by the time of the November update to this next budget deal, per instructions to his commissioners. Ferreras-Copeland also noted Friday that although the mayor had added to the city’s existing reserves, bringing them to a total of about $7 billion, this number is essentially flat compared to last year and expenses have risen in the same time. Facing Council questioning was Dean Fuleihan, director of the Mayor’s Office of Management and Budget, who defended the “strategic investments” and “disciplined fiscal management” of the administration, pointing out that the $2.3 billion citywide savings program is the largest in five years with more to come in the November update. He also stressed the city’s substantial rainy day funds. Budget watchdogs and rating agencies do agree that this administration has been fiscally responsible in its spending but many have called on the city to boost these reserves to insulate against a widely forecasted economic downturn. Throughout the hearing, Fuleihan repeatedly emphasized the administration’s willingness to collaborate with the Council on its proposals. He said multiple times, “We’re happy to continue that conversation,” whether it was to Council Member Steven Matteo on his request to discuss property tax rebates or to Council Member Ben Kallos, who brought up issues of performance budgeting and contract overruns. As evidenced by de Blasio’s latest budget outline and Friday’s hearing, one of the most important issues at play right now is the city’s plan for reforming and revitalizing NYC Health + Hospitals, which was laid out in a new report, One New York: Health Care for Our Neighborhoods. The executive budget has $180 million in fiscal 2017 for the hospital system, with the ultimate aim of avoiding a $1.8 billion shortfall by fiscal 2020. At Friday’s hearing, the Council was skeptical of the administration’s plan, with Ferreras-Copeland questioning whether it addressed long-term budgetary concerns from federal cuts under the Affordable Care Act and the system’s decline in revenue generation. These issues were also raised later by Council Member Corey Johnson, chair of the health committee. “There’s I think...a lot of assumptions in the $1.8 billion plan, $700 million in expense savings, $1.1 billion in new revenue generation,” said Johnson, questioning Fuleihan on the risks of the plan. “Of course there’s risks,” Fuleihan said, acknowledging that the city would have to work with federal and state authorities for reimbursements for health care costs and possible Medicaid waivers. Multiple Council members also addressed what they see as underinvestment in city youth, particularly the Summer Youth Employment Program and afterschool programs under School's Out New York City (SONYC), key issues the Council had highlighted in its preliminary budget response. “This is a major and serious issue for us that 34,000 young people will not have an opportunity to have a summer program, a summer camp experience that they experienced last year and we have heard no viable solution,” said Council Member Laurie Cumbo. Council Member Helen Rosenthal asked about the city’s bond ratings, which Fuleihan said have been strong and stable. Rosenthal also called for fully funding nonprofit human services contractors. The issue was the subject of an oversight hearing chaired by Rosenthal in April. 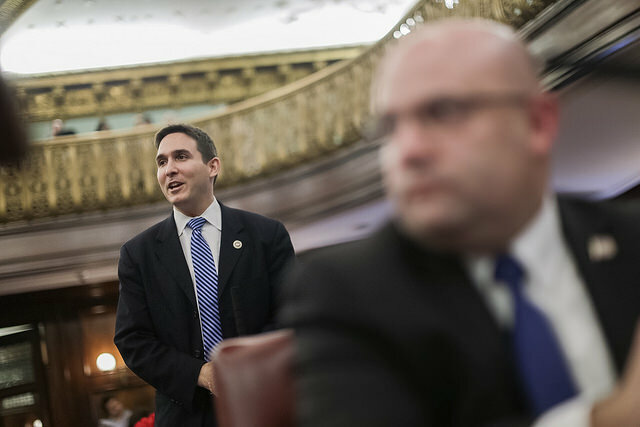 Council Member Matteo, the Republican minority leader, called for increased funding to emergency rooms in Staten Island hospitals and for the city’s district attorneys. Council Member Vanessa Gibson made a similar request for additional DA funding. Council Member Jimmy Van Bramer asked for more funding for cultural institutions, echoed by Council Member Cumbo, who pointed out that arts funding has been flat for a decade and the discounted memberships under the IDNYC program posed significant costs for cultural institutions. The Council’s executive budget hearings will continue for the next few weeks, looking at individual city agencies, with the last hearing scheduled for May 24 where the public will be invited to comment. Following that, the Council, led by Ferreras-Copeland and Speaker Melissa Mark-Viverito, will negotiate behind closed doors with the administration before coming to an agreement by the June 30 deadline. To fulfill its duties and ensure smooth electoral processes, the BOE will need to hire and train thousands of poll workers, hold state-mandated voter registration drives and, given unforeseen circumstances, organize special elections. It wasn't surprising then that City Council Member Ben Kallos, chair of the governmental operations committee, which has oversight of the BOE, at a preliminary budget hearing on Monday expressed deep dissatisfaction with how the Mayor's Office of Management and Budget (OMB) has consistently lowballed the BOE in preliminary budgets for three years running. Bordering on anger, Kallos pointed out that the BOE preliminary budget allocation of $88.4 million is a steep drop from last year's adopted budget of $140 million. Kallos asked BOE Executive Director Michael Ryan if the low figure is sufficient for the somewhat monumental task of running elections in New York City. "The short answer to that is 'no,'" Ryan responded. He estimated that the BOE would need $138.5 million for fiscal year 2017, which begins July 1, and that it was run-of-the-mill for the administration to set a "placeholder budget that encompasses all of the agency's absolute, ironclad, 100 percent obligations, contractual and otherwise." As with the last two years under this administration, Ryan said he expected full funding to be incorporated into the executive budget, which de Blasio will release later this spring. This didn't seem to be the answer Kallos was looking for. He faulted OMB for engaging in a process that gives the Council little oversight over what ends up in the BOE's final budget. It "frustrates the purpose of preliminary budget hearings and this isn't happening at any other agencies," Kallos said, stressing that a better way would be to allocate a higher budget and then pullback as needed. Ryan did make allowances for OMB's process, calling the budget negotiations a "partnership endeavor" that always yielded the desired result. He stressed that the BOE budget was a "moving target" depending on the election cycle, but did concede that "$88 million is south of the bare minimum" for the BOE to run smoothly. OMB spokesperson Amy Spitalnick, in a statement emailed to Gotham Gazette, echoed Ryan's rationale. "There is always some unpredictability and variability in what BOE requires each year based on the number of contested races, poll sites and workers, special elections, and more, which makes it impossible to baseline one set amount," Spitalnick said. "The City always funds what is needed later in the budget process, once many of those outstanding factors are determined." Kallos, however, may not let that reasoning stand in the future. At the hearing, he promised to hold OMB feet to the fire if it continues to play a game of "cut and restore" with the BOE budget. "If OMB ever puts this low a number again," Kallos said, "I want them here for this hearing so that they can tell me why they think you should be able to work with $88 million." "The elections in democracy are too important to be playing these games," Kallos added. Throughout the proceedings, two main themes emerged: concerns over what Governor Andrew Cuomo’s state budget proposal means for the city and the extent to which the de Blasio administration is saving in anticipation of an economic downturn. There were also a series of specific budget issues and priorities raised by Council members throughout hours of testimony that first featured de Blasio budget director Dean Fuleihan. The hearing kicks into full gear the process of negotiating the city’s spending plan for fiscal year 2017, which begins July 1. As Council hearings proceed over the next month, different issue committees will hear testimony from agency commissioners, leading to the Council’s official response to the mayor’s preliminary budget. Their response is due by March 30. Finance Committee Chair Julissa Ferreras-Copeland, in her opening remarks, clearly emphasized her belief that the city needs to find ways to reduce costs and increase reserves, and that the biggest fiscal challenge now facing the city is Gov. Cuomo’s proposed budget, which cuts nearly $1 billion from New York City funding. 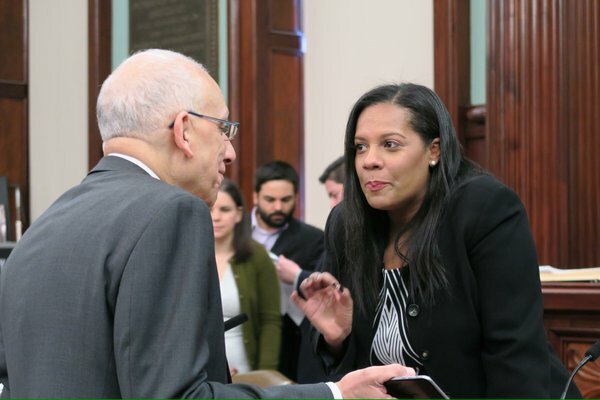 Ferreras-Copeland noted that though the governor has insisted the proposed cuts to Medicaid and CUNY funding “won’t cost New York City a penny,” he made no changes in his recently-released 30-day amendments to the state budget released on Feb. 12. Still, Mayor de Blasio has not taken those cuts into account in his budget, which raised several eyebrows at Tuesday’s hearing. De Blasio and his top officials have insisted that they will hold Cuomo to his word, though no discussions have yet occurred wherein the two sides can work to find the “efficiencies” that Cuomo is demanding. 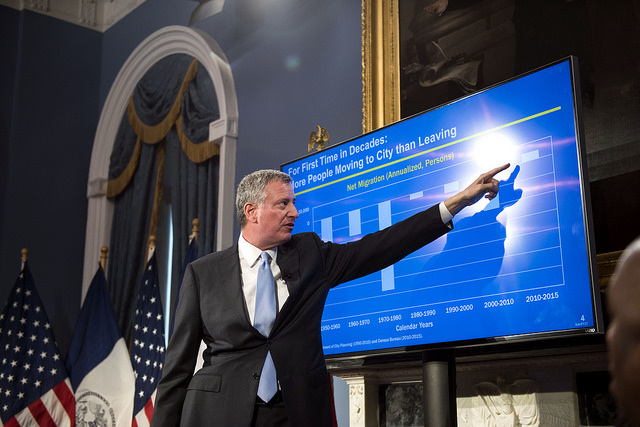 Ferreras-Copeland acknowledged that Mayor de Blasio’s preliminary budget, released on Jan. 21, put forth many progressive proposals, but warned that the city must brace for a possible economic slowdown. As she has in the past, Ferreras-Copeland indicated that she does not believe the administration has a strong enough savings program in place. Preliminary budget estimates put city reserves at $6.6 billion, compared to the $11 billion before the Great Recession ($7 billion was used to pull the city out of that downturn.) The $6.6 billion also marks a percentage of city spending far short of what watchdogs recommend. The plan also includes $1.8 billion under the Citywide Savings Program, which was created by the mayor to find voluntary savings in city agencies. Last year, the CSP savings were $3 billion. “Not only is this amount low relative to the size of the budget, but most of the savings in the plan appear to stem from accruals, delays in spending, and other non-recurring savings – raising the question of whether these savings find real efficiencies, or whether they are just a more accurate reflection of true costs,” Ferreras-Copeland said. Fuleihan did announce publicly Tuesday that he and his Office of Management and Budget had sent out a letter on Monday calling on all agencies to find savings across the board without reductions in services or relying on new fees, fines, concessions or making any layoffs. “Agencies will be required to find productivity and management improvements by restructuring the delivery of programs or services, using technology to produce efficiencies, improving revenue collection, reducing administrative and overhead costs, and funding underused programs at the appropriate levels,” the letter stated. Ferreras-Copeland said the letter was welcome news. She also laid out at least $20 million in savings identified by the Council and said that the Council would continue to look for savings as it goes through budget documents and hosts agency commissioners at upcoming hearings, which continue Wednesday. 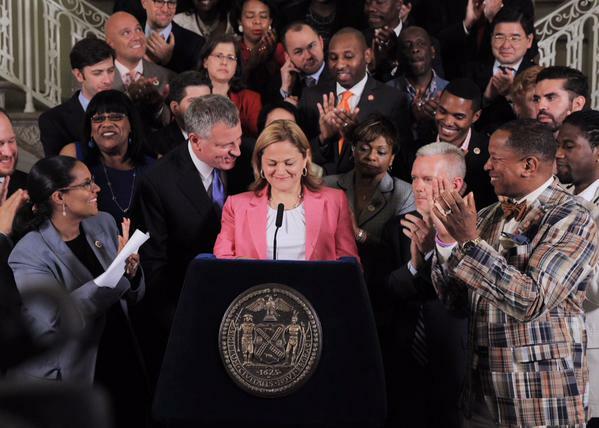 Echoing Ferreras-Copeland, Speaker Melissa Mark-Viverito noted that the Council would have to build on its reserves. “I believe the mark of a true progressive is not just one who seeks to create change but does so in a manner that is sustainable over the long term,” she said. Mark-Viverito also said the proposed state budget could have “serious consequences” for the city’s budget, but shouldn’t stop city officials from negotiating the budget. Fuleihan said he shared Ferreras-Copeland’s and Mark-Viverito’s concerns. He also stressed the challenges stemming from increased pension costs and from federal funding cuts necessitating changes in the city’s healthcare system. Although Fuleihan agreed with the Council on the need for more savings, he said the city’s reserves, which will be just under 7 percent at the end of Fiscal 2016, are at the “right level” for the city’s present needs. 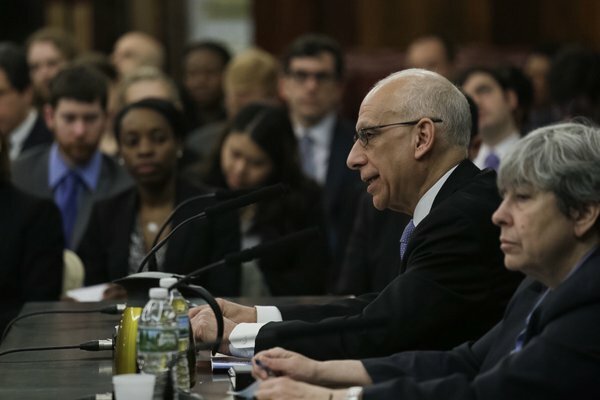 Both Comptroller Scott Stringer and Ronnie Lowenstein, director of the Independent Budget Office (IBO), testified that the city’s reserves are insufficient to weather an economic downturn and called for a more robust savings program to boost reserves. Lowenstein said “even for a modest downturn” the city only has enough in reserves to get through the following two fiscal years after a downturn begins. However, Lowenstein cautioned that it may be quite difficult for the city to put more into reserves if the governor’s proposals requiring additional spending from the city are enacted. Although the city’s finances are in good shape overall, several economic risks lay on the horizon. Most pressingly, Cuomo’s proposed cuts, but also signs of trouble on Wall Street and from international markets, including China. Yet another move is brewing in Albany that could cost New York City roughly $1 billion if approved - the proposal put forward by state legislators to impose a 2 percent property tax cap on New York City. Analysis of the city’s finances from the IBO indicate “of the nearly $2.0 billion in growth we project in tax revenues in fiscal year 2017, $1.6 billion is expected to come from increased property tax collections. By 2020, we estimate that property taxes will account for 46 percent of the city’s tax revenues.” While Mayor de Blasio touts that he has not raised property tax rates, increases in property tax assessments create increasing revenues as values rise. Mayor de Blasio’s decision to aid the city’s struggling public hospitals, known as NYC Health + Hospitals is another issue that must be addressed when the executive budget is released in late April or early May, something Fuleihan acknowledged in his initial testimony. During the initial three hours-plus of the hearing, Council members took turns questioning Fuleihan, seeking answers mostly about issues germane to committees they either chair or serve on. Council Member Brad Lander asked about how the $15 minimum wage for city employees and contracted workers would be implemented and then moved to homeless shelters, saying they were perpetually under-budgeted. Lander said the 15 percent reduction in the homeless shelter population predicted in the preliminary budget was unrealistic, to which Fuleihan replied the city will decide on a more appropriate projection when the 90-day review of the Department of Homeless services concludes two weeks from now. Analysis submitted by the IBO predicts that in 2017, city-funded spending to shelter homeless families and adults will cost $101 million more than currently budgeted under the mayor’s plan. Stringer reiterated his call for money spent on homelessness to be spent more effectively, given that the city will spend $1.7 billion on shelter operations and homelessness programs this year across three agencies - a figure that has grown 46 percent in the last two years. Minority Leader Steven Matteo, head of the Council’s three Republicans, first addressed property taxes, which he wants to see reformed, then wondered about the costs of the city’s pension obligations and when they would be fully met. Because retired employees are now living longer, the city’s pension contributions have needed to increase by about $600 million annually beginning this year. Fuleihan testified that the pension system is currently “71 percent fully funded,” and the city is on track to have the pension system fully funded by 2032. Council Member Jimmy Van Bramer called for baselining library funding and ensuring that cultural institutions are adequately funded. He chairs the Council’s cultural affairs committee, which includes the libraries subcommittee. Council Member Helen Rosenthal, chair of the contracts committee, directed questions to Fuleihan on the feasibility of reinstituting the Central Insurance Program which would allow workers contracted by the city to buy health insurance at lower rates and using the CIP to meet federal guidelines for overhead on city contracts. She also asked about irregularities in NYCHA security contracts and transparency with Department of Education contracting. Williams pushed for increased funding towards the Summer Youth Employment Program, in effect doubling what the city has promised so far, a concern echoed by Council Member Laurie Cumbo and Ferreras-Copeland. Cumbo, as chair of the women’s issues committee, wanted to know what the city was doing to invest in women’s safety. Council Member Mark Levine commended the administration’s funding towards legal services for tenants in housing court and inquired about how much the city saves down the line from anti-eviction services. He also brought up the issue of infrastructure needs in upzoned neighborhoods. On most of these specific issues raised by Council members, Fuleihan was non-committal, largely listening and expressing that he understands Council members’ concerns. Preliminary budget hearings continue with the transportation committee and higher education committee on Wednesday. Some of the most prominent city agencies will again spend considerable portions of their budgets on employee overtime in fiscal year 2016, set to begin July 1, 2015. The allocation of $1 billion toward personnel overtime raises questions around optimal staffing levels and balancing cold fiscal calculation with whether understaffing might impact performance and well-being of employees. City officials argue that staffing levels are mostly appropriate and the overtime expenditures being made is wiser fiscal policy than additional full-time hiring. There is widespread agreement, though, that employing overtime control mechanisms is in the best interest of the city. In his preliminary $77 billion budget for fiscal year 2016, Mayor Bill de Blasio has included just over $1 billion for personnel overtime, mostly spread across the city’s vital public safety agencies. Over three-quarters of the sum, about $798 million, is in anticipated overtime work by uniformed employees, such as police and corrections officers, firefighters and sanitation workers. There are a variety of reasons compelling the city to rely so heavily on overtime, but one in particular stands out: it actually saves the city millions of dollars. “In many instances overtime is going to be cheaper, up to a certain point, than bringing in new recruits,” said Doug Turetsky, chief of staff and communications director at the Independent Budget Office, a publicly-funded budget watchdog agency. The NYPD remains one of the most overtime-burdened city agencies. For fiscal 2016, the department is allotted more than $423 million in overtime just for its uniformed employees, nearly 16 percent of the agency’s total salary budget, according to the preliminary budget outine. Civilian personnel overtime will cost an additional $248 million, according to a report released by NYPD Commissioner Bill Bratton during a March budget hearing at the City Council. Other New York City agencies are also wrestling with staffing levels and heavy overtime expenditures, which the de Blasio administration have been working to address. According to the mayor’s preliminary budget, released in February, the FDNY has projected overtime expenses of more than $204 million and will allocate 16 percent of its personnel budget for overtime. The budget also estimates the Department of Correction will spend over $84 million in overtime, 8.3 percent of its total personnel expenditures; and the Sanitation Department over $91 million, 8.7 percent of its uniformed personnel services - according to figures that do not include snow removal, which increases overtime costs every year. But, it is seasonal expenses like snow removal that city officials and others say it makes sense to utilize overtime for rather than upping full-time staff. The remaining $300 million in overtime is allocated to cover the cost of work in other agencies, including $23 million for the Department of Environmental Protection; $35 million for the Department of Transportation; and $17 million for the Administration for Children’s Services. Both Commissioner Bratton and City Council Speaker Melissa Mark-Viverito have argued that the NYPD is understaffed, calling for new hiring. For a second straight year, the Council is calling for the hire of 1,000 new officers and new measures to curb NYPD overtime spending. “In order for NYPD to continue to keep New Yorkers safe while also implementing new reforms and initiatives we need to increase the overall headcount of the department,” Mark-Viverito said in a statement just before the Council released its preliminary budget response. Mark-Viverito also pointed out that each police precinct in the city lost an average of 60 to 75 officers since its peak headcount in fiscal 2001, and that NYPD has to systematically demand officers work overtime in order to meet the city’s daily enforcement demands, and sometimes has to rely on non-patrol precinct staff to work parades and sporting events. Bratton appears to have asked the mayor for the green light in hiring 1,000 new cops. But Turetsky, a budget expert who has studied the city’s expenses for years, said he is skeptical the demand will be entirely met, citing the cost of the operation as the main issue. “Our estimate is that 1,000 [new] cops will eventually cost about $100 million [per year],” Turetsky said, adding that the Council plan appears to include NYPD hiring 500 new officers, half the number requested, in each of the next two years. Turetsky said that the costs will ramp up over multiple years, in part because city pension contributions do not get made immediately. Between 2009 and 2014, overtime expenditures for the NYPD averaged $484.6 million, according to a report on the fiscal 2015 Executive Budget issued by the City Council. Amy Spitalnick, a spokesperson for the City’s Office of Management and Budget, said the NYPD has used overtime mostly to fund public safety programs targeting specific times of the year, citing as an example the anti-violence summer initiative the NYPD rolled out in 2014. “NYPD overtime is not currently being utilized to cover positions that require an officer year-round,” Spitalick said. “In order to address the crime conditions of a short period, overtime was utilized to increase security for that specific time period in specific locations as needed.” This was also true in December, 2014 as protesters took to the streets on several nights in response to the non-indictment in the Eric Garner grand jury case. Despite a reduction in overtime expenses since de Blasio took office, New York City is behind other major cities around the country in terms of money allocated to police overtime - thus leading to the call by the Council and other budget watchdogs for the City to implement an overtime-cost savings plan. The Los Angeles Police Department, for instance, allocated only 2 percent of its personnel costs to overtime for its current fiscal year, a significant drop since 2010, when it hit 10 percent, according to data released by the Office of Los Angeles Mayor Eric Garcetti. It is similar with the Houston Police Department, which maintains its overtime expenditures under 5 percent of the total personnel cost, according to the Mayor’s Office of the City of Houston. Experts say that Los Angeles and Houston police departments may be aided in keeping down their overtime costs because both metro areas are served by both police departments and other law enforcement agencies like the Los Angeles County Sheriff's Department and the California Highway Patrol in LA and the Harris County Sheriff's Office in Houston. The NYPD is the only law enforcement agency on regular patrol duty across the five boroughs. This may contribute to the NYPD, the largest police department in the nation with over 49,000 full-time employees (including about 35,000 uniformed officers), struggle to keep overtime under control. Looking at the budgets of other cities where street patrol is the jurisdiction of the municipal police department alone, the numbers are closer to those in New York City, though they are still fairly far off. The Philadelphia Police Department, for instance, is spending over $50 million in overtime salaries this year, more that 11 percent of its total personnel expenditures, and the Chicago Police Department, the second largest municipal law enforcement agency in the nation, allocated $71 million in overtime pay, about 6.7 percent. The NYPD is at about 16 percent. Meanwhile, staffing issues at FDNY have been chronic for several years, beginning during the Bloomberg administration, when the uniformed headcount fell from 11,459 in 2009 to 10,646 in 2011, before reaching a record low of 10,180 in 2013. FDNY overtime expenses shot up from $152 million in fiscal 2009 to over $292 million in 2014, the fiscal year during which Bill de Blasio took office, and the FDNY spent nearly 29 percent of its salary expenditures in overtime. And these increases in overtime expenditures have not coincided with or been a tool toward a decrease in overall department spending. Decreased headcount and increased overtime at the Fire Department began with an event that had nothing to do with money-saving strategy. In 2007, the department was sued in a major civil rights lawsuit concerning its hiring process, and since 2009, when Judge Nicholas Garaufis ruled FDNY’s admissions test discriminated against African-American and Latino applicants, a court order practically froze new hiring for several years. Although the Fire Department significantly reduced its use of overtime in the last two years, the projection for fiscal 2016 remains large. Overtime expenditures at FDNY and elsewhere, especially NYPD, are indeed often the result of unforeseen events, rather than being a carefully planned piece of staffing and budgeting calculations. In the fall of 2011, during Occupy Wall Street protests, the NYPD spent $17 million to keep police officers on the streets overtime, then-Commissioner Ray Kelly said at the time. In late 2012, Superstorm Sandy required significant extra work by public safety agencies. In the days of the storm and its aftermath, the city spent over $154 million in overtime from October 29 to December 24, according to a report published by the Independent Budget Office. Of that total, over $70 million was spent in NYPD overtime, nearly $54 million for sanitation overtime, and nearly $9 million went to FDNY overtime. Events unfolded last winter leading to high overtime bills. The protests over police brutality and the Garner grand jury decision cost the city $22.9 million in NYPD overtime, Commissioner Bratton said during a press conference in December. By early January, the Staten Island Advance reported the OT bill was up to $35 million. A Gotham Gazette review of the Comprehensive Annual Financial Reports for fiscal years 2004 through 2013 published by the Office of the New York City Comptroller shows that overtime expenditures have been stubbornly on the rise since 2004, around the end of Michael Bloomberg’s first term. In 2004, the Bloomberg administration and City Council adopted a budget with over $507 million in overtime, but ended up spending more than $777 million. In 2006, the adopted budget projected overtime expenses of nearly $620 million. By 2010, expected overtime costs reached $848 million, before hitting an adopted overtime expenditure of $1.05 billion in 2014. In December 2013 the Citizens Budget Commission, a nonpartisan watchdog organization, issued a report totaling the final cost of overtime work during fiscal 2013 at more than $1.4 billion. “That administration didn’t have a strategy to limit overtime,” Maria Doulis, director of city studies at Citizens Budget Commission, told Gotham Gazette about Bloombeg’s, calling it “an open question” as to why the OT costs were allowed to increase so dramatically during his tenure. At the time the CBC report came out, the organization encouraged the city to limit overtime through a series of reforms. One was cracking down on endemic absenteeism; another was to find more efficient ways to staff predictable events, such as community festivals and parades, without extending employees’ normal shifts. By adopting such measures, the report outlined, the city would have saved about $125 million. Beside the financial aspect, there is another side of the overtime coin. While overtime is a budgetary tool that can help agencies save money in training and benefits, long work shifts also affect not only performance, but the safety of the employees and the public as well. This is particularly true in the case of the Department of Correction, an agency that spends heavily on overtime, and where, according to a report compiled by the office of U.S. Attorney Preet Bharara, understaffing and psychological stress has played a role in the episodes of violence at Rikers Island jail complex, which have been on the rise. It is something the de Blasio administration has pledged to address with reforms it recently announced. Since he took his post as corrections commissioner, Joseph Ponte has looked for ways to fix the city’s correctional system as part of what the administration unveiled as a 14-point anti-violence agenda, a bundle of reforms that would act to calm a climate of violence and abuse at Rikers. One of the points in the agenda focuses on reducing overtime. “Recruiting, hiring and training more officers are key planks of Commissioner Ponte’s 14-point anti-violence agenda,” said Eve Kessler, a spokesperson for the Department of Correction. Kessler added that the department is also planning an overhaul of recruiting procedures, with the intention of improving the standards used in the hiring of new officers. The Correction Department estimates that 8.3 percent of its total salary expenditures, over $84 million, will pay for overtime next fiscal year, which begins July 1. Despite being lower than the current year, when it topped $124 million, overtime is still one of the department’s key issues, especially from the point of view of safety for both officers and inmates. Note: this article has been updated with a correction from IBO's Doug Turetsky on IBO's estimates of the costs of 1,000 new officers being added to the NYPD force.